As a guitar teacher I was extremely curious and excited when I first heard about Fretlight guitars and after a long time I managed to find somebody who offered to lend me their guitar for me to try out. In addition to trying out the guitar for a couple of weeks, I contacted guitar teachers around the world who actively use Fretlight guitars in their lessons to see how useful the guitar actually is as a learning tool. 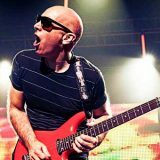 This review gives you an overview of my experience as well as feedback from over 40 guitar teachers around the world who use Fretlight guitars with their students. So if you’re a beginner thinking about getting a Fretlight guitar, this review was created for you. The concept behind the Fretlight guitar is simple: each fret position can light up with an inbuilt LED. The guitar connects to software such as Guitar Pro 6 and can light up scales, chords or even songs on your fretboard while you play. From a learning point of view this is an incredibly effective way to learn guitar because the LEDs will provide you with instant feedback on which notes to play and memorize. There’s no other way of achieving this other than placing tacky stickers on your guitar. The guitar is based around the feature that each fret position on each string can light up with inbuilt LEDs (including the open position – the nut lights up). 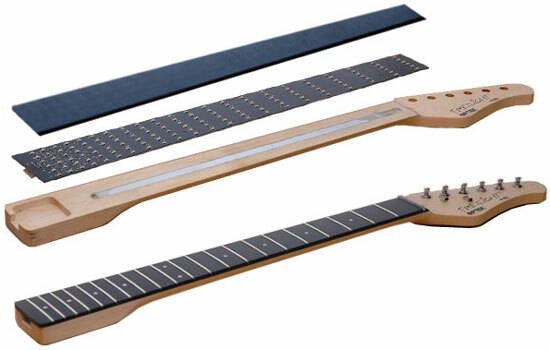 This is achieved with a polymer fretboard that looks and mainly feels like any other fretboard. The diagram below shows how the LEDs are embedded in the fretboard. Without the software the Fretlight is useless as a learning tool. 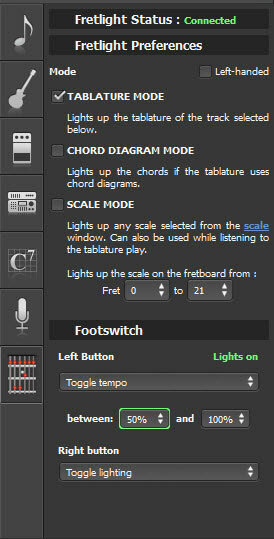 Fretlight do have their own software – Fretlight Studio – which comes free with a Fretlight guitar. The software allows you to light up scales, chords, songs and various lessons and videos. The software is basic but gets the job done. Fretlight guitars are also compatible with Guitar Pro 6 – however if you already have GP6, you might be disappointed to find out you need a special version called ‘Fretlight Edition’ to work with you Fretlight guitar. 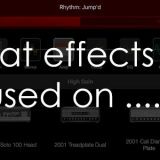 This software allows you to load up any Guitar Pro file and light up the relevant frets used during the song. This is something that only Fretlight guitars can do at the moment. It’s a great way to display riffs and licks on your guitar and can really assist when learning new songs. The screenshot on the right shows the extra feature window available when you connect a Fretlight guitar to GP6. Notice there is the option for a footswitch which allows you to control different aspects of GP6. The three modes allow you to light up different things on your guitar so you can plenty of flexibility over how you use the guitar. This software is designed to be used by guitar teachers during lessons. So if you’re not a teacher, skip this section. As a guitar teacher I was interested to see how to get the most out of the guitar during lessons. The idea behind this software is that you can ‘paint’ notes onto the student’s Fretlight guitar. To do this you need to have a MIDI capable guitar and use it to play the notes you want to light up on the student’s fretboard. Unfortunately while this sounds like a handy feature to have during lessons, I don’t currently have a MIDI pickup so I wasn’t able to test it out. 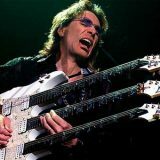 I have to admit that even if I did have MIDI pickups, the $400 price tag for such as minor ability would not be worthwhile for me or most other guitar teachers – especially when it’s easy enough to light up scales and chords on the free software. Fretlight guitars use USB which makes it very easy to simply plug the guitar into your PC/Mac and load up the relevant software. I had no issues loading up the Fretlight Studio software or GP6 and managed to have scales and chords light up the guitar effortlessly. While the Fretlight Studio software feels out of date, GP6 provides an excellent platform to use the Fretlight system effectively. Optek (the company behind Fretlight) have recently released an SDK to allow software developers to create their own programs for Fretlight so hopefully there are creative programmers out there who can create something useful for guitarists. What I like about the FG-421 is the pickups it comes with. They have replaced the single coil pickup usually found in the bridge position with a humbucker. This layout is far more useful for beginners as the humbucker can give you the right tone for rock, metal and any other harder styles. The tone of the guitar wasn’t anything special but keep in mind that the main purpose of this guitar is it’s learning capabilities. Of course you can always change the pickups like any other guitar so if you really don’t like the quality of the tone the stock pickups produce, take them out and put something else it. I see this as a beginners guitar and beginners shouldn’t be concerned about achieving that ‘perfect tone’ guitar magazines try to push. This is a learning tool and is a very good one as you will read later. As a guitar teacher I see students come in with a wide range of guitars. Some students come to their first lesson with a $2000+ guitar and I’ve had other students come in with a $80 ‘bargain’ (read: rubbish) they picked up from a garage sale. Unfortunately, this guitar was on the lower end of the quality scale. The guitarist I borrowed the guitar off admitted that he tried to make improvements to the bad fretwork, but because of the custom fretboard, there wasn’t much he could do without potentially damaging the LEDs. My research found that Fretlight owners either love the quality of the guitars, or they feel the guitars are ‘junk’ as one honest guitar teacher told me. For this reason I want to simply say that if you plan on buying a Fretlight guitar, be sure to read any return policy if the guitar you receive isn’t up to scratch. I feel really conflicted when it comes to Fretlight guitars. On one hand as a guitar teacher I know that it’s an excellent learning tool when used the right way. When I tested the guitar out in lessons, it was obvious how much of a positive impact it had on my students. So as a guitar teacher I can see the unique benefits only available to Fretlight guitars. But on the other hand I’m disappointed. The build quality of the guitar left a lot to be desired and I feel the price just doesn’t match the quality of the guitar. Yes the Fretlight system is amazing – but as I’ve found out, students don’t practice on guitars that don’t feel right. I really want to like Fretlight guitars but at the moment the experience I had borrowing one wasn’t good enough for me to recommend it to everyone. I’ve got a feeling that if I had of tried the Pro model I might have had a different experience, but with the FG-421 I’m concerned about the quality of the guitars. Other reviewers have praised the quality of the guitars but I’m seeing too much inconsistency between reviews. So to summarize: as a guitar teacher I highly recommend Fretlight guitars as it’s an excellent learning tool. As a guitar player I don’t recommend Fretlight guitars due to the inconsistent build quality. Sorry Fretlight – I’ll be keeping a close eye on future models you release and am really looking forward to improvements in build quality in the beginner range. I rate the Fretlight FG-421 three stars overall: four stars for the Fretlight system and minus one star for the FG-421 guitar I borrowed. I know that sounds harsh – but even my beginner students commented on how bad the guitar felt in their hands. Beginners: the Fretlight system is an incredibly effective learning tool which can make a big difference to a beginner. When combined with GP6 it can give you a lot of flexibility over how you learn chords, scales and songs. Guitar teachers: the Fretlight system can give guitar teachers a lot of flexibility on how to present new topics to students. When I tested Fretlight in my lessons, the benefits were obvious. As long as the guitar you buy arrives in good condition, it will be ideal for lessons. Intermediate/advanced guitarists: although this guitar is listed in the ‘Intermediate’ section on Fretlight’s website – I wouldn’t recommend it to anybody above beginner level. As a beginner the low build quality won’t be too much of an issue, but as an intermediate or advanced guitarist, it will put you off the guitar very quickly. The Fretlight system is still extremely useful for even the most advanced guitarists, but when paired with a low quality guitar it’s just not worth it. The Pro guitar may be worthwhile but unfortunately I haven’t tried it and am not willing to risk $900+ to find out if it’s worthwhile or not. You can easily light up any chord shape you want from the software and that’s useful to help you memorize chord shapes. But loading up one chord at a time on the Fretlight guitar is fairly limited from a learning point of view. A better way to use the Fretlight to learn chords is to load up Guitar Pro 6 and enter in a chord progression. Let each chord ring out for a full bar. Turn on the metronome and loop the progression. Now the chords will light up on the Fretboard and change after each bar. This will teach you to practice changing between chord positions – which is the proper way to practice chords. You can then easily replace the chords and can even speed up or slow down the tempo. Guitar Pro 6 has a huge chord library and you will be able to practice not just open chords, but any chord shape on the fretboard. My students found this method extremely useful. The Fretlight system makes learning chords so simple. Just pick a scale and you can run up and down and practice them any way you want. This is far more effective than learning set shapes such as the five Pentatonic patterns. With the Fretlight you will learn to play a scale all over the fretboard. I feel this is where the Fretlight is most effective. Simply load up a scale and play a backing track to jam over. Now you can freely improvise all over the fretboard without being limited to the areas of the fretboard you’re already familiar with. It’s very liberating as it will allow you to stop guessing where the correct notes are and start thinking about what you want to play. It was an easy way to introduce modes or exotic scales to my students and they memorized the scales very quickly with this approach. I highly recommend using the Fretlight system as a way to practice improvising. If you load up Guitar Pro 6 you can set the guitar to Tablature mode, which will light up the relevant frets used in a song as you play along. At first this sounds like a great way to learn a song as the lights will guide you to the right frets. In reality it doesn’t work that well. I loaded up a song I’ve never tried before and avoided looking at the screen to see how easily I could learn from the lights. The main issue is that you will always be chasing the notes. There’s no way to see what notes are coming up so you have no idea which fingers to use or when to change to the next note. Compared to Rocksmith, this is a very cumbersome way to learn songs. Instead of using Fretlight to learn songs from scratch, I recommend using it to help memorize licks or riffs. Simply highlight and loop the lick in GP6 and now you have a way to practice the riff without having to stop and look at the screen whenever you forget what notes you need to play. So think of this as a way to improve or master parts of songs rather than learn them from scratch. It’s much faster to first learn the song by reading the TAB, then use the Fretlight system to improve your performance and build up your tempo.